Frequent Traveler Happy Hour in support of Toys for Tots 10 December! It’s the holiday season, so of course, its time again for a Frequent Traveler Happy Hour for Toys for Tots! We started this tradition in 2016, and partnering with Ed from Pizza in Motion and Jeanne from Le Chic Geek, we made it even bigger in 2017. 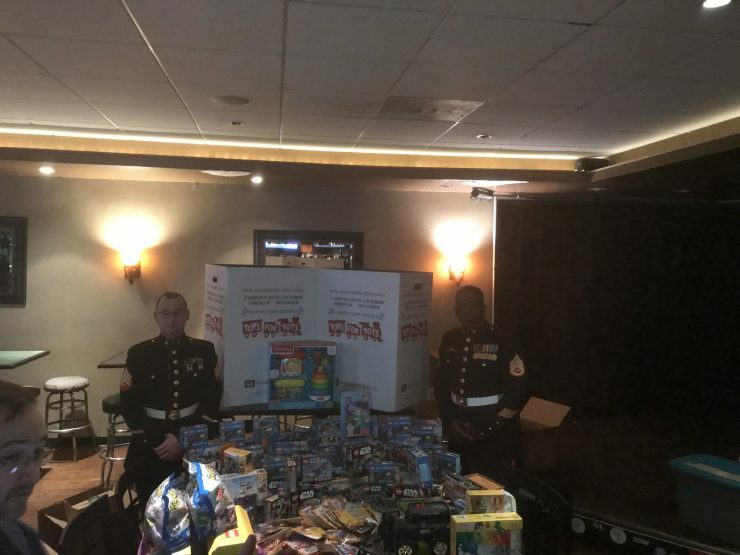 Toys for Tots 2018 Event – Tons of toys! And we’re doing it again this year! The event will be 10 December, 6-9pm. We’ll have representation from the US Marine Corp to accept the toys (and our appreciation for their service). We’ll have friends, fellowship, and plenty of great time to talk travel! Please take a moment to register. We are asking that you bring a toy for a child that might otherwise not have a toy underneath their tree. When I originally got into this community, I got in via blogs that shared tips to generate miles and points–and ultimately–great experiences, because they wanted to help. Randy founded FlyerTalk, then later partnering with others–including Ed Pizzarello himself– founding MilePoint with a similar goal in mind. Sharing the amazing things available for folks that want to put some effort in, to get amazing travel opportunities. That grew further to include doing good for others. There’s a MilePoint Kiva Lending Team that is doing amazing good for people who might otherwise not get microloans to do good in their own community. All of these things were inspiration for us in the travel community to do good. With that in mind, we invite you to the bring a toy, do some good, and share in the holiday revelry with fellow travel hackers. If you’re wondering about the best way to procure such toys, this week, you are bound to find fantastic deals where you can leverage Shopping Portals to get some miles while you’re helping to make kids’ Christmas! All of those are Walmart links because, as of writing this post, you can get 5% cashback on toys via the Ebates shopping portal. Here’s hoping we’ll see you on 10 December at Bar Bao to support Toys for Tots and talk travel!